Finding information on the internet is easy. Finding the right information is a little bit more of a challenge. When working with the internet in the classroom, especially when differentiating for a wide range of learners, teachers need to be able to find sites that match the needs of their students. One interesting tool I have found for this purpose is netTrekker. netTrekker is a pay-to-play search engine that allows students and teachers to search for information, lessons, games, and media by reading level, state standards, and content. netTrekker also features a text-to-voice option for struggling readers, automatic dictionary and language translation tools, an ELL channel, and a 21st century skills channel. View the video below for more information on netTrekker's features. http://www.smithsonianeducation.org/educators/index.html This site provides amazing lesson plans that are searchable by grade, standards, and subject. The plans include book suggestions (at various levels), links to other websites, and integrates items from the Smithsonian Institute's collections into the lessons. Wow! http://www.edutopia.org/blogs/tag/differentiated-instruction This page at edutopia.org features a wealth of information on diverse learners and cutting edge differentiation techniques. http://www.pbs.org/teachers/ This site is similar to that of the Smithsonian Institute and features fully web-integrated, standards-based lesson plans. Click here for a sample lesson plan. http://www.byrdseed.com/differentiator This is a tool for building your own differentiated lesson plan using Bloom's Taxonomy. It is somewhat simplistic technologically speaking, but it could be very valuable for focusing a scattered plan. http://wowinschool.pbworks.com/This is a very interesting project that is using online gaming (World of Warcraft) to help at-risk students learn. It includes lesson ideas for various subjects and has a section on supporting research. This is cutting-edge thought when it comes to differentiation. http://www.cyberbee.com/intclass.html This site offers lesson plans and ideas for using the web in the classroom. It could be used in tandem with netTrekker (or any text-to-speech software)to support differentiation for struggling learners. http://www.internet4classrooms.com/using_task_cards.htm I love this simple idea: make individual "task cards" to guide students in their internet research. This would be so easy to differentiate - just color-code the cards for different ability levels! http://www.cetla.howard.edu/teaching_resources/curriculum_design/docs/learning%20objectives.pdf This document contains information that helps teachers to define clear learning objectives - useful for any sort of lesson planning! http://www.ning.com A search for "elementary education"on Ning brought up a group called "Classroom 2.0", a second group that discusses technology in education, another group that explains uses for Google in education, and much, much more. Ning is an invaluable resource for meaningful networking and idea sharing between educators. http://www.google.com Use Google docs and Google advanced booksearch for planning any number of differentiated activities. Since Google docs is connected with personal e-mail accounts, it is usually better for planning activities for middle or high school students. There are plenty more fine sites to help teachers plan differentiated lessons and units, but this list is a very good start! What the heck do I do with my gifted learners? http://www.stemtube.com/ This is a site where kids make and share videos related to science, engineering and technology. http://www.exploratorium.edu/The museum of art, science and human perception has terrific online activities and a huge list of experiments with video, diagrams, etc. http://www.scholastic.com/teachers/lesson-plan/creating-classroom-economy-unit-plan Here is a lesson plan for creating a classroom economy. Very advanced students may be interested in creating their own economy and having their classmates participate. http://www.glogster.com Glogster may not be suited to all elementary students, but it would be great for advanced students who like to spend a lot of time on interest-based projects. Students can make interactive online "posters" about any topic. http://youthvoices.net/ This is a dynamic website that uses podcast, video, voicethreads and more to facilitate discussions and idea interchange. It includes info. on curriculum planning. Keep in mind that netTrekker can help teachers locate materials that are appropriate for students with high reading and comprehension skills. The Web 2.0 technologies listed under "Other cool sites..." are also appropriate for tiered assignment that can help build gifted students' higher-order thinking abilities. 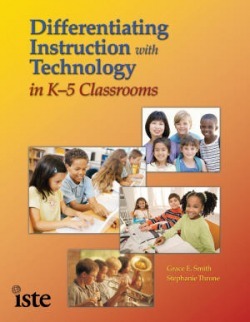 This book is a perfect resource for any elementary teacher who wishes to integrate web-based learning into her differentiated curriculum. It contains chapters on differentiating by content, process, and product. Click here to purchase this book (or to browse its contents) at Amazon.com. LD, ELL, at risk - What is out there? http://www.esl-galaxy.com/ This free site features lesson plans, printables, games and more. An excellent resource for differentiating for the ESL student. http://www.brainpop.com/ This is an amazing, award-winning pay-to-play site that features research-based games and lesson plans as well as interactive whiteboard support. It has an entire sub-site dedicated to ESL and is leveled - perfect for struggling learners. netTrekker members have an option of purchasing a combined membership to Brainpop. Keep in mind that netTrekker has text-to-voice technology that is excellent for LD kids. These two sites would be well worth the money spent. http://www.starfall.com/This free phonics site is perfect for struggling readers. http://www.studyisland.com/ This is a pay-to-play, research-based site that is customized based on your state's standards. It has built-in remediation and is great prep for standardized testing. http://www.educationcity.com/ Another pay-to-play site that includes games that support special ed and spanish-speakers. http://www.ficwad.com/ I think that fan fiction is a great idea for kids who don't want to write and it would be great for LD kids who have been put off of reading and writing. All you need is to find one book the student REALLY likes, then have the student write his own stories based on the characters. Use voice-to-text tech if needed, then share online. Dynamic, creative, and fun. http://www.storylineonline.net/ Famous actors read books aloud. Kids can read along. http://www.ixl.com/ This pay-to-play math site is very high-tech. It enables teachers to track student progress and features fun games targeted at specific math skills - perfect for any student, really, but the tracking capacity makes it especially useful when working with LD kids. http://a4esl.org/ This is a somewhat dry, but nevertheless useful, site that features quizzes and activities for ESL students. The best part about this free site is that it includes bilingual quizzes for speakers of 30+ foreign languages. http://www.mywebspiration.com/ This is a site for building graphic organizers and using visual thinking. Again, good for any student, but may be particularly useful for building alternative activities for LD or ESL students. http://wowinschool.pbworks.com/ I mentioned this site above, but it bears repeating: at risk kids need a hook to get them interested in learning and wanting to come to school. What better way to do that than to integrate gaming into their study? http://www.fodey.com/generators/newspaper/snippet.asp Make and save your own newspaper clipping! http://www.tuxpi.com/ Quick and easy photo effects and frames. http://www.weebly.com You are here! Build a website or blog in a snap! Free and easy. http://kidblog.org/home.php Blog hosting for students and teachers. http://www.diigo.com/ Share bookmarks, sticky notes, network, and more. http://www.animoto.com Easily make animated slideshows (with audio, if desired). http://www.wordle.net Paste in any text and produce an awesome wordcloud - a graphic representation of word frequency. Word(le) to the wise: you must do a screen capture in order to save a Wordle image. http://www.tagxedo.com/ This site is an advanced word cloud generator where the user may turn the wordcloud itself into a picture. Very cool! http://www.mosaizer.com/Wordaizer/ Yet another word cloud generator similar to tagxedo - but this one is a free downloadable application, rather than a web-based tool. http://audacity.sourceforge.net/ Free audio recorder for making Mp3's for podcasts. http://www.podbean.com Nice site for hosting podcasts. http://ed.voicethread.com/#home Reasonably-priced pay-to-play online interface for constructing collaborative digital stories and sharing conversations. http://questgarden.com/ A great site for finding and sharing webquests (which are virtual scavenger hunts). There is likely no web 2.0 technology that is beyond the elementary learner's grasp - it is simply up to the teacher to decide how to best use the available technology based on the students' individual ability. With a little planning, web-based technologies can be part of every class day - or even every lesson, if your school has the necessary technology base. Like anything else, use of the internet for differentiation in the classroom is limited only by the teacher's breadth of imagination. There are so many research-based creative resources available (and fully written lesson plans) that there is really no reason why even the least web-savvy teacher could integrate 21st century web-based learning into his curriculum.